No Ipods, no Internet, no TV, radio and not even newspapers and books (unless you were wealthy ). What do you do to keep from getting bored? Here are some ways that the Anglo Saxons had fun in the dark evenings. There was a high degree of ceremony connected with feasts. It would start outside the hall. A horn was blown to summon the guests to table and the host would great them at the door where there would be a hand washing ceremony at the door. The doors were shut to keep gate crashers away! Then the guests would enter and sit at benches lining long tables. The king's warriors or thegns could sit in his halls but only men of high rank would sit at the high table. Women of high rank would be cup bearers and pour drinks for the king and lords. In the Christian era bread was blessed and then broken in remembrance of the Eucharist or holy communion/ mass. 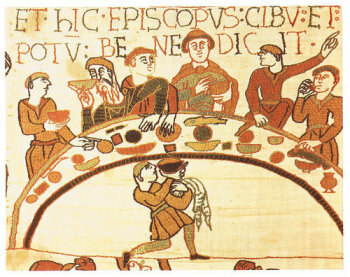 Feasts might go on all day and night: there were even some 3 day feasts. Entertainment at feasts: These might include playing the harp, lyre, horn, trumpet, drums flute or cymbals. There would be accompanying signing: often songs recalling battles. They enjoyed dancing and juggling, poets and stories and the asking of riddles. Here is a typical Anglo-Saxon riddle from the Exeter book which has many riddles. Some are obscure and some lewd and suggestive. This one is straighter forward. On the wave a miracle: water turned to bone. What is the answer? See at the end of this section. The Anglo-Saxons were fond of dice games. Dice were made from the knuckle bones of animals such as pigs. Boardgames were also popular and often recalled battles in a symbolic way. 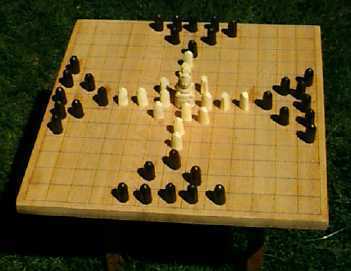 An example is Hnefatafl which is played using stone pieces on a carved wooden board. One player's pawns coming from the corners of the board would attack the other side's king and pawns which were positioned in the centre. The player with the King would be trying to get him off the board (to escape from the battle) whilst the other player would try and trap him. These un-even games – where the two sides were of different sizes and abilities – were very prevalent in Anglo-Saxon and later Viking cultures. Horse racing was mentioned in Beowulf in 8th century and by the writer Bede in 7th. There are records of dog racing, hunting, ice skating, swimming, falconry, hawking, acrobatics wrestling and gymnastics. There are more riddles here.